Tara and I took a walk to Chuck’s Produce yesterday to stock up on healthy snacks. For some bizarre reason that escapes me, I saw kale chips on the shelf and thought, yum! 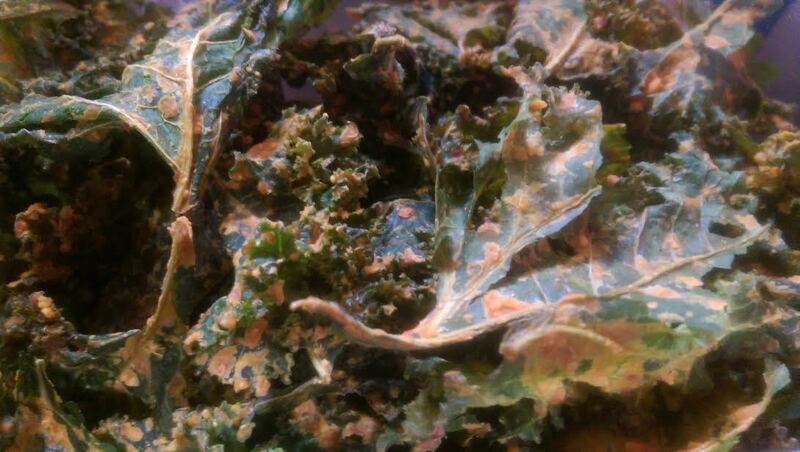 I have no idea what I was thinking, as I’d never even had kale chips before. Hello, impulse shopper! Right? You have no idea how many weird things I have purchased over the years just because they happened to be in my line of vision when I was waiting in the checkout line. I’m the type of guy who would buy a leaf blower if I lived in the desert. And then I’d justify it by blowing all the tumbleweeds into the next yard vast tract of cactus-riddled empty space. So, yeah. Is it any wonder I suddenly had to have those kale chips?! Let’s just say I wish I’d left them on the shelf. Even the fact that they are “lava Sriracha” flavored does not rescue these bad boys from being a taste disaster. Fresh kale is pretty bitter and bland to begin with. Freeze-drying it improves neither the flavor nor the consistency. It actually resembles a plastic tub full of weed (which, given the legality of recreational marijuana in Washington and Oregon these days, would not be an entirely ludicrous assumption…but don’t worry, mom. It’s kale, I swear). So, in case you are unclear, I am not a fan of the kale chips. But I am a fan of Somersaults. These “crunchy nuggets baked with sunflower seeds and toasted grains” taste much better than they sound. Especially the Dutch Cocoa flavor. They’ve got just one gram of sugar and are low enough in carbs and high enough in fiber and protein (“as much as almonds with half the fat”) that I can enjoy them guilt-free. I’m also a fan of Skinny Pop popcorn, Snapea Crisps, Blue Diamond almonds, and anything with the word Kashi in it. Hard to believe I’m the same guy who used to go to town on bacon. It’s also hard to believe that Christmas is this week! I’ve definitely had more spirit than last year (gee, ya think?!) when, unbeknownst to me, I was suffering from health problems and days away from an ER visit/hospital stay. We are mixing up traditions this year – normally, my aunt has us over to her place on Christmas Eve for a Russian dinner and celebration, but they will be out of town so Tara and I are going to be hosting at our place instead. She did a test run last weekend and her pelmini turned out delicious, so I’m confident that we’ll be able to pull this off. The following week, we are going to Ely for New Year’s. We hadn’t planned another Nevada trip, but her grandparents are celebrating their 60th anniversary and we figured that was kinda important, you know? Not many couples make it through six decades of wedded bliss. I’m just hoping for snow. My last two New Year’s trips to Ely were busts in the weather department; it’d be nice to see some of the white stuff this time around. Nothing exciting like that going on around here, just rain (lots of it – PDX just broke the record for wettest month ever at 13.52″ and another 10 days to go) and wind (lots of that, too – big windstorm forecast for this afternoon). So many people have told me that homemade kale chips are good, I might give them a go! To me, it’s not the crispy chip that is the issue – it’s that weird “lava Sriracha” seasoning. I’ll try making my own and report back! Me too, Mark! I’m a HUGE fan of all those you mentioned 🙂 And I have to say that even though I’ve never tried the kale chips, I don’t think I’d like them either because I’m not a fan of kale, period. I know, can you BELIEVE it’s almost Christmas?!?! This month has flown by so fast. And too hope we get some snow but I doubt it very much since it’s predicted to be in the HIGH 70’s on Christmas day. BUMMER 🙂 I’m really scared that we are just not going to have ANY winter/snow this year. I looked up your weather forecast this morning out of curiosity. All I can is…Ouch. Not very Christmas-like, is it? But look at the bright side: at least you’re saving money on heat this year! Have a fantastic Christmas, my friend! Enjoy your better health!! I have never tried the kale chips, so thank you for the review. Personally, I think Skinny Pop tastes like styrofoam. The only ‘healthy’ junk I’ve liked is RiceWorks chips. Wishing you a wonderful Christmas, Mark! I haven’t tried those, but I’ll give them a go if I see them in the grocery store. I’m always on the lookout for new healthy snacks, so if you have any other suggestions feel free to share them! Oh, and I hope you and your family have a very merry Christmas, too!! That goes without saying. That recipe sounds delicious, Pamela! As I told another commenter here, I’m going to try making my own. I feel like with the right combination of flavors I might actually like them. I’ll let you know! I’ve had the epic misfortune of trying kale chips once as well. The way they just dissolve instantly upon your tongue makes me anxious that I unwittingly invited some alien virus into my body as part of some bitter tasting sci-fi experience. Never again I say, but then again it may already be too late. Now that I’ve invited them in once, whose to say that I will be able to resist the next time the hubby wants us to try some other super food. Yes! They’re like those church wafers I remember as a kid…although I actually enjoyed the way they dissolved on my tongue. I’m into chia seeds now. I’ll bet I’d get along great with your husband! Hope you guys have a very joyful Christmas! Church wafers. I hadn’t connected the two, but you absolutely nailed it. I am fairly certain you would as well. He’s been enjoying sneaking those into our breakfast for the last several weeks. You and yours have the the same! What a dumb name for a vekaleble. Merry Christmas.